Jaan Albrecht, CEO of Austrian Airlines, expects that the Austrian subsidiary of German Lufthansa will not need further financial aids from its holding company. The Polish government grants a massive capital injection for the financially stricken airline. The airline industry in East and Southeast Europe faces enormous difficulties. Not only Polish LOT needs immediate help. Poland´s national airline LOT gets financial support of more than € 100m. Traffic Results from January to November 2012: 1.7 percent more passengers carried. November 2012: Rising passenger volume despite fleet reduced by four aircraft. Positive trend in capacity utilization continues. In order to reduce redundancies, Austrian Airlines (AUA) wants to streamline its company structure. After Air Berlin decided to reduce the number of flights from Vienna to Eastern European destinations, Austrian Airlines intends to fill the gap. From January – October 2012: 1.7 percent more passengers were carried. In October, the number of passengers was down slightly. In the first nine months, AUA´s operating income was positive. However, the restructuring process will go on. AUA´s restructuring programme begins to take hold. The result for 3rd Quarter nearly doubled to € 61m. January-September 2012: 2.1 percent more passengers carried. September 2012: Fewer passengers due to reduction of capacity. Austrian Airlines invests over 90 million euros in conversion of long-haul fleet. The Austrian subsidiary of Lufthansa will not achieve a positive net income this year. First Airbus A320 to enter operation in fleet renewal lands in Vienna and is expected to be put into operation on 1st October 2012. Austrian Airlines Traffic Results for August 2012: Targeted capacity adjusted, further improvement of passenger load factor. After the insolvency of Malev in March 2012, the Hungarian government is said to promote a new airline. AUA´s capacity utilization rose substantially. Against July 2011, the number of passengers was down by 5.6%. Due to special items, Austrian Airlines could achieve positive results in the first half year of 2012. In 2007, Austrian Airlines should not have recorded a profit, but a substantial loss of € 235m, auditors says. Lufthansa´s subsidiary Austrian Airlines upgrades its airplanes. Ten long distance plances will be renewed. For Austrian Airline´s CEO Jaan Albrecht, the implementation of the austerity program and the transfer of undertaking is mandatory. AUA: Strong Growth in Passengers to Eastern Europe. Austrian Airlines traffic results June 2012: Significant passenger growth in the first half year. The transfer of undertakings is completed. About 2,000 AUA staff members shifted to the regional airline Tyrolean. 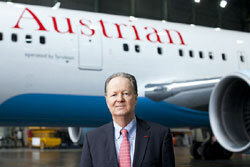 AUA´s CEO explains that about 80% of the reorganization of Austrian Airlines has been achieved. The airline would be on the right way, Albrecht affirmed. Because of the austerity package, 118 pilots left Austrian Airlines. CEO Jaan Albrecht wants to bring them back. The opening of the new Skylink is starting on 5 June 2012. The € 800m investment brings numerous changes for passengers. CEO Albrecht underlines that further austerity packages are not excluded. Now, Austrian Airlines faces new challenges. The loss-making Austrian Airlines has only little time left to achieve the turnaround. Lufthansa´s patience is wearing thin. Until now, 80 pilots and 170 flight attendants decided to leave Austrian Airlines. The deadline runs until the end of May. 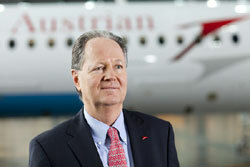 Executive Board Member Peter Malanik leaves Austrian Airlines. The former Swiss executive board member Gaudenz Ambühl will head new flight operations. 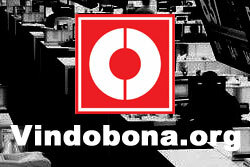 The Austrian trade union vida intends to prevent the transfer of undertakings. Thus, the dispute will not be settled soon. The transfer of undertakings may induce costs of € 280m. According to rumors, AUA´s management may be partially changed. During the weekend, Austrian Airlines had to cancel 24 flights. A surprising mass illness among AUA´s pilots occurred. The transfer of undertakings at Austrian Airlines is irrevocable, the management points out. In case of a lack in pilots, Lufthansa and Swiss would close the gap. There seems to be no end to the turbulences at Austrian Airlines. The owner, the German Lufthansa, considers selling AUA in case of a failed restructuring. After the management of Austrian Airlines refused to start new negotiations, the works council wants a vote on the transfer of undertakings. Austrian Airline´s works council tries to prevent the already resolved transfer of undertakings to Tyrolean. AUA´s management does not want to re-negotiate again. After having implemented the austerity package, Austrian Airlines wants to expand. Above all, more flights to the U.S. will be offered. After the transfer of undertakings, the CEO of Austrian Airlines aims to create a collective agreement for the whole workforce. Further cuts are not excluded. Bad news for Austrian Airlines: the result from operating activities reaches € -66.7m. AUA refers to higher kerosene prices and the air travel tax. Nevertheless, the turnaround should be reached in 2013. The re-started negotiations between AUA´s management and the aircrew have finally failed. A mass exodus of pilots is feared. 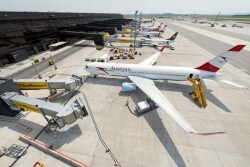 The Austrian air passenger transport reached an all-time high in 2011. After months of heated debates, the works council and the management agreed on a new collective agreement. The aircrew must approve the agreement. The long-lasting dispute at Austrian Airlines is settled. The management board and the works council agreed on a new collective agreement.